A chalkboard theme is a great idea for a bridal shower. There are many ways to build this concept. So, whether your party is formal, vintage, or very casual, you can still use this idea. You may have noticed the variety of chalkboard items available. You can use them throughout your plans, or just as some accent pieces. Either way, you'll see how they help to personalize your event. • Plan a date and time for your bridal shower. Then choose the location. 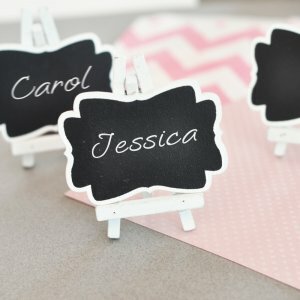 You can announce your theme with one of the many personalized Chalkboard invitation choices. • Decorations can include: "Welcome" or direction signs, photo booth backdrops, writable balloons, and personalized banners. All are available with the ability to customize. • Games can include charades, hangman (using bridal shower words), or any activity that keeps with your theme. The following items are available in a chalkboard design. Incorporate some or all of these ideas into your buffet or sit-down meal. • Have a menu board announcing your individual dishes. You can use one large one, a variety of small ones, or both. • Mark each buffet item on a mini board set on an easel. 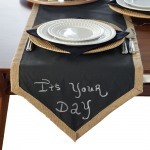 • Give each guest their own chalkboard coaster. • Decorate the table with a table runner. You can draw designs ahead of time, or let guests add their wishes. 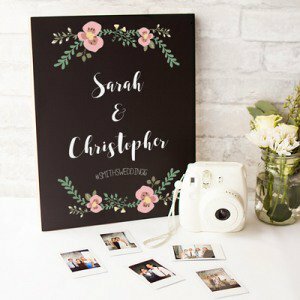 • What bride-to-be wouldn't love to receive this Personalized Wedding Chalkboard Sign to use on her big day? Welcome guests, use as a prop for photos, or display on the head table. • Erasable boards are available to be used in a kitchen or office, if it fits their style. • Attach a box of chalk, on top of the present as part of the wrapping, to any gift you have purchased. This is a way to keep with the theme. • Do you need other theme ideas?